Excellent office space closet to busy Manhattan. Transport is easy and convenient using the transit rail or Ferry and driving through Holland tunnel. Different office configurations are on offer. The office suites are very modern and come with many technological functions. Safe and secure building access at all times, high speed network access, and the centre offers many nearby shopping and eating amenities. Ideal for one-person and small businesses, this is a creative co-working space with great natural light and a range of business services available. This center enjoys an ideal location close to the light rail stop, ferry, PATH and bus routes. Just 15 minutes from central Manhattan and its Tech Alley this Hoboken business center has a great Hudson River waterfront that provides tenants with wonderful views. Hoboken Municipal Court is only three blocks away, making this location perfect for attorneys. Moreover The W Hotel and Enterprise Rental Car are right next door, perfect for your clients when they come to visit. The area has excellent transport links and offers convenient services. 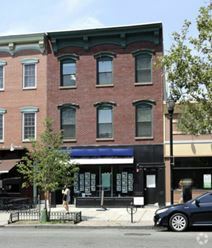 This building in downtown Hoboken has been renovated. Modern office space is available with abundant natural light, high speed internet and luxury furnishings. Each of the three floors has a coffee bar, and a conference room is available with video conferencing facilities. The center is located close to the PATH station.